Ferret with hair loss and wobbliness. My ferett has lost all hair on back and i came home today and he is extremly wobbly and sick looking and unbalance I dont have a vet in my area that sees ferrets and nobody is open with it being new years. he has never acted this way and im afraid he is going to die is there anything i can do at home to get him threw until I can locate a vet monday? Oh, I am sorry to hear that Winston is having these problems. I am concerned about the symptoms you are describing. While I can't say for sure, if a ferret is really wobbly it may mean that he has something called an insulinoma. An insulinoma is a tumor on the pancreas that is producing too much insulin. This will make the blood glucose level go dangerously low. If this is what is going on then he could get some temporary help by giving him a sugary substance such as maple syrup or corn syrup rubbed on his gums. Unfortunately insulinoma is a cancer. Some ferrets can be treated with surgery but this is a very serious condition. 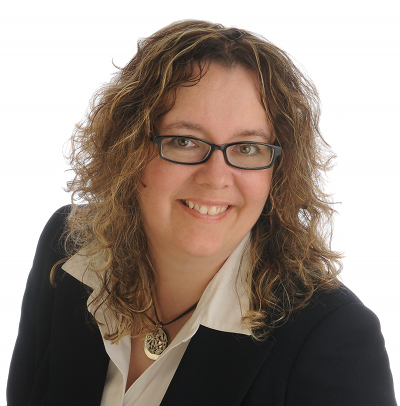 However, hair loss is often a sign of an adrenal gland problem. Ferrets with adrenal disease will usually have hair loss on any of the rump, tail, sides and chest. When the disease is really serious they will be weak, wobbly and lethargic. There are some treatments for adrenal disease but they can be expensive and are not always successful. 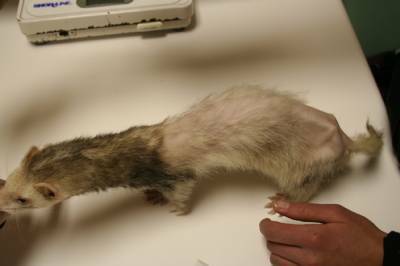 Some ferrets with adrenal disease also have insulinoma at the same time. Is there an emergency vet in your area? It sounds like Winston really does need to be seen this weekend. Even if he has some temporary help with the syrup it will not help for long. I wish I could give you more hopeful advice! Often vets who do not see ferrets will be willing to see one on emergency. Even a non-ferret vet should be able to help you determine if this little guy can make it. I am worried with the symptoms that you have described that he may not survived. He may have advanced adrenal disease. If he seems really uncomfortable you may need to consider euthanasia for him. Again, a non-ferret vet will probably be willing to do this for you. I wish I could give you some at home treatment to do, but there really is not much else that you can do for him at home. Oh, poor guy. The gagging that you are describing may be something called agonal breathing. This happens often just as an animal is dying. If he is at the point of agonal breathing then there is a good chance that he is not feeling any pain at this time. Usually when an animal is having agonal breathing they will pass away within a few minutes. But, if this is continuing for more than 15 minutes then you really should seek out an emergency vet to put him to sleep. I pray that he goes quickly. I'm so sorry. I really think Winston needs to see a vet. I'm glad that he is up now but I don't think he is very comfortable. I wish I could advise you on more, but there are limitations when talking over the internet.